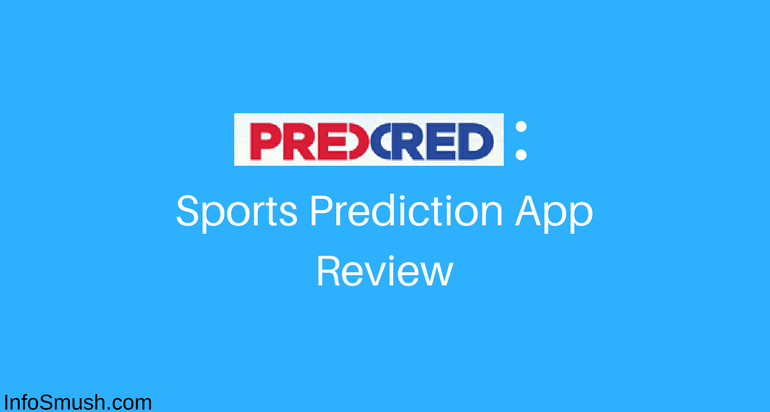 PredCred is a sports prediction app where you can predict the winner or outcome of a match or player battle for creds. 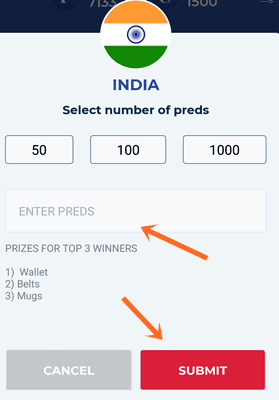 Creds can be redeemed for various vouchers or Paytm Cash. So, if you were a user of Rooter and stopped using it after Paytm gift cards were removed you can try this app. Paytm Voucher has been removed from the "Redeem" page. To earn more Paytm cash try the best app. 2. Register or Continue with Google or Facebook. 4. 500 Preds will be instantly added to your account. So What are Preds & Creds? 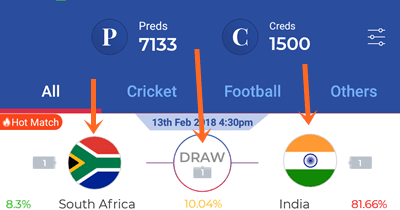 Preds are a virtual currency which you can stake on a player or team. When your prediction comes true you'll win Creds. The amount of creds you win is equal to the number of preds you staked and the preds you staked will also be added back to your account. Creds can be redeemed for a number of vouchers and gift cards. 1. Select a match, tap on the logo of the team you want to predict for or tap on Draw. 2. Now stake your Preds. You can stake any number of Preds. You can also make a detailed prediction. In detailed prediction, you have to predict who's going to take the most wickets, hit most fours, most sixes, etc. Other than Creds top 3 winners will also get special prizes. For every 3 successive correct predictions, you will get 1 spin. With lucky spinner, you can win various coupons including OYO, Avis, Chokore, etc. Refer your friends and when your friend enters your referral code you both get 500 Preds. 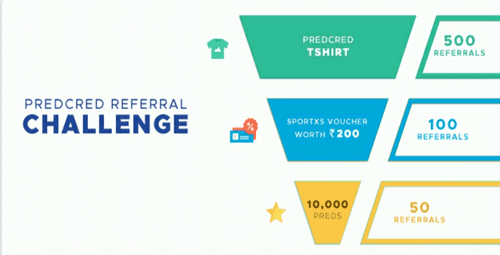 Currently, there is a referral challenge going on where you can win 10,000 Preds for 50 referrals, SportX Voucher worth Rs.200 for 100 and PredCred T-shirt for 500 referrals. Other than referring your friends you can also claim Preds as Daily Bonus. You can redeem your Creds for a great number of Gift Vouchers and Paytm cash. You can also redeem your creds for Flipkart gift cards besides Electronic Products and other Accessories. 1. Open the App and go to the redeem page. 2. Tap on the Rs.25 Paytm voucher. 3. Now tap on the "Redeem" button in the bottom-right corner. 4. A window will pop-up that displays the voucher code. You will also get a message to your registered number and an e-mail. 6. Open Paytm app or open Paytm in the browser. 7. Tap on "Add Money"
8. Enter the amount (25) and click on "Have a Promo Code?" 9. Now enter the voucher code and apply the code. You will see a success message:"Success. Cashback of Rs.25 will be credited to your account within 24 hours". 10. Now tap on "Done" and then "Add Money". You will see a message saying that Rs.0 has been added to your account. That's it you'll get Rs.25 in your paytm wallet within 24 hours. I have redeemed 3 Paytm vouchers and always got paid.So, yes. PredCred is a legit app. 55222a298Here are best materials for you! Using voucher codes are far simpler than collecting gifts promo codes. All you need to do is to enter a code combination while purchasing an item and you get to own it at a discounted rate.